Country music artist and cancer survivor Wade Hayes will host the second annual “Country Hits Back” benefit concert March 7 at the Franklin Theatre. 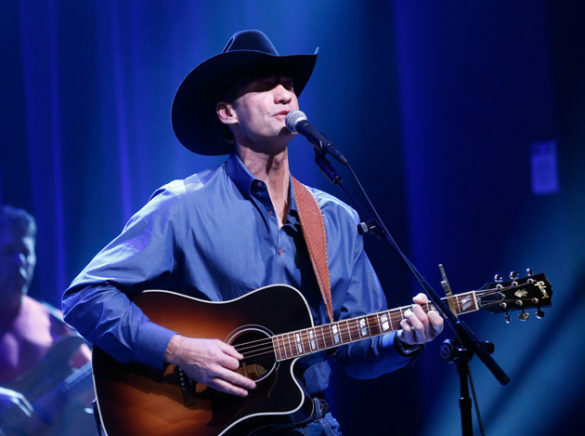 Country music artist and cancer survivor Wade Hayes will host the second annual “Country Hits Back” benefit concert Tuesday, March 7, at 7 p.m. at the Franklin Theatre, located at 419 Main Street in Franklin. The event will support vitally important cancer research at Vanderbilt-Ingram Cancer Center. Singer-songwriter Randy Owen of ALABAMA fame will join Hayes for the concert. The group ALABAMA has sold more than 75 million records, and its members have been inducted into the Country Music Hall of Fame. Also joining Hayes and Owen will be multiplatinum and Academy of Country Music Award-winning artist Tracy Lawrence. Lawrence’s hits include “Time Marches On,” “Paint Me a Birmingham” and “Find Out Who Your Friends Are” with Tim McGraw and Kenny Chesney. Hayes was just 42 when symptoms including abdominal pains and bleeding sent him to his physician. A colonoscopy screening revealed that the singer had Stage IV colon cancer. Colorectal cancer is the No. 2 cancer killer of men and women in the United States. One of Hayes’ VICC physicians was Jordan Berlin, Ingram Professor of Cancer Research and co-leader of the Gastrointestinal Cancer Research Program at VICC. When tests showed Hayes was cancer-free after three years of treatment, Berlin told him to “go live your life.” Hayes found inspiration in the advice, co-writing the song “Go Live Your Life,” which is also the name of his latest album. For details about tickets to the VICC benefit concert, visit the Franklin Theatre’s website.